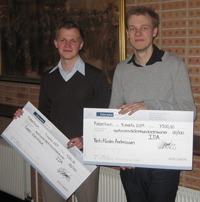 Søren Øxenhave and Niels Kloster Andreasen presented their 1st prize winning master’s thesis project Activity-based Interaction Models for Next Generation Mobile Devices at The Danish Society of Engineers (IDA). The project has been carried out in milab under my supervision. There is also short article (in danish) in the news section on the DTU Informatics website about the event and the master’s thesis project. Congratulations to Søren and Niels! This entry was posted in blog and tagged apps, competition, mobile by Jakob Eg Larsen. Bookmark the permalink.